TORONTO — The rebuilt Toronto Raptors opened the NBA playoffs like so many editions before them — with a loss. But the message in the post-game locker room was: It's only one game. "(It's) first one to win four games," Marc Gasol said. "You go back, watch film, see what worked, see what didnt work, see what you've got to better and play the next game. "Win or lose, we'll come back and do the job again." "I think (Lowry) had some really good looks that he's gonna normally knock down," said coach Nick Nurse. "We need to get him involved a little bit offensively and we need some points from him. . . (But) I look down and I see he was a plus-12 in the plus-minus and he had zero points, so he was still impacting the game greatly. I'm sure he'll bounce back and play a little bit better next game." The Raptors are by far the more experienced team, their 320 playoff games by the starters before Saturday numbering almost 10 times that of Orlando's. 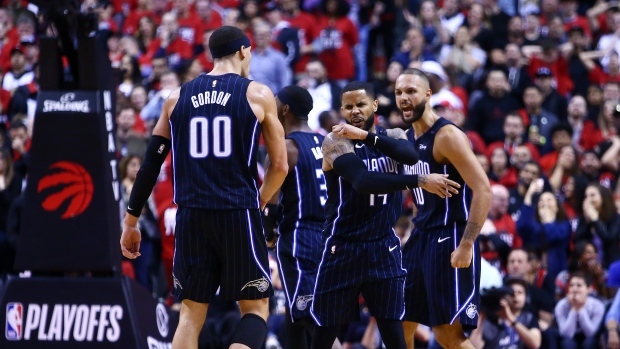 But the Magic, who've been one of league's hottest teams since the all-star break, matching Toronto's conference-best 22-9 record over the final 31 games of the season, clearly didn't get the memo. "Our goal was to make the playoffs but not just make it," Augustin said. "We want to make noise and win a series or two. We feel like we can, we believe in ourselves." "It's the playoffs, you're going to go up and down," Leonard said. "Everybody wants to win the game. That dry spell in the first and then second quarter hurt us a little bit, but we were able to keep coming back, and push in that third quarter." The Raptors led by as many as six points midway through the fourth, but the Magic clawed back with a 10-2 run that had them leading with two minutes to play. Leonard's fadeaway jumper from in front of Orlando's bench had the Raptors up by two with 1:02 to play, but Augustin answered with a jump shot to tie the game. Gasol had a three-point shot bounce off the rim. "They made some tough shots, but (our) communication could be a little bit better," Lowry said. "We've got to play a lot harder. . . But you learn your lesson and continue to get better. It's a long series. Unfortunately we have an uphill to climb but we are made for it." The Scotiabank Arena crowd of 19,937 was a sea of red, and erupted in a spontaneous ovation moments before tip-off when former Raptor Jonas Valanciunas was spotted taking a seat courtside. Valanciunas, who was traded to Memphis for Gasol in February, said in a TV interview during a timeout that he "wanted to come and support my guys." The Raptors were missing key reserve OG Anunoby, who had an emergency appendectomy on Thursday. There's no timeline for his return. The figurative wheels fell off in the second. Leonard missed all five of his shots, the Raptors shot a combined 30 per cent, and a running dunk by Nicola Vucevic put Orlando up by 16. Green's three-pointer with a second left on the clock capped an 8-0 Raptors run to cut Orlando's lead to 57-49 at halftime.